Brian Keeping was a young closeted gay mechanic who lived in Ashbrooke, one of the most un-PC homophobic, backward little towns in mid-west America. 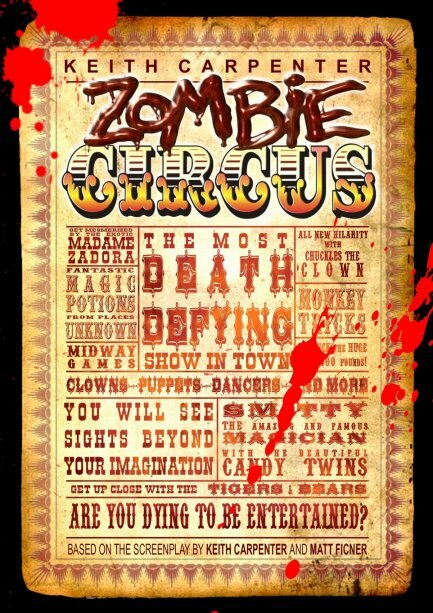 One day the traveling circus came to town and he, along with his two best friends, thought maybe a trip to the circus would be a welcome diversion from the monotony of their sleepy little town, but to their horror everything went terribly wrong. It seemed their sleepy little towns dark history was about to come back to haunt them as a result of a heinous crime that had been committed sixty years earlier. The zealous pastor and self appointed moral leader of Ashbrooke, Harry Farwell, coaxed his congregation to rise up and run the "sinful" Fink and Zimner Freak Show and Circus out of town. Instead they ended up putting it to the torch and condemning the circus and it's performers to a horrible fiery death. All but one that was... the sole survivor, the circus' fortune teller Madame Zadora, was in possession of a mysterious tonic she acquired from her motherland Romania, which had the potential to bring upon the town, a horrible curse of the UNDEAD. Now the new circus has come to town and all hell is about to break loose, in more ways than one. This Zombie fest of the highest order takes the genre to places it's never been before and we know you will be DYING to read it! Buy now in print version from Amazon or digital E-Book downloads.